When most people think about snakes, tarantulas or other exotic creatures, they tend to get the heebie-jeebies. One local man who has a fondness for the creepy crawlers turned his love for the animals into a business venture. 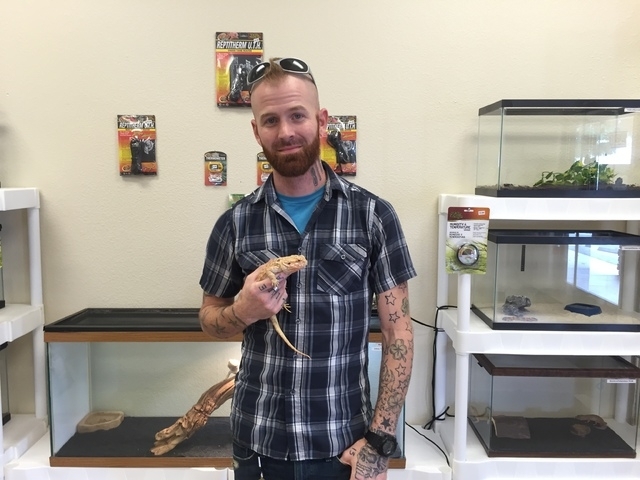 Night and Day Reptiles, located at 401 S. Frontage Road Suite B, specializes in exotic animals and owner Nick Glasgow has been in the business for some time. After getting out of the military, Glasgow turned his fascination for the animals into a career, working in various pet shops which specialize in exotic animals in Las Vegas. He transplanted to Pahrump from Las Vegas to be near his fiancee and her family last year and got the idea to start his own business out of his home. After seeing some success in running the shop out of his home for the last year, Glasgow decided it was time to open a storefront. Since transitioning from a home-based business to a stand-alone business, Glasgow explained the initial result has been positive, but there’s still work to be done. “It’s actually been excelling pretty quickly,” he said. “Still trying to market and get my name out here … trying to get down the marketing situation. A lot Glasgow’s current customers are familiar faces as the ones who dealt with him out of his home have followed him over to the storefront. “It’s pretty much been all familiar faces so far at this point,” he said. Glasgow explained the store specializes in reptiles and invertebrates, the supplies needed to care for the exotic creatures, such as cages, tanks and feed supplies. “We have bearded dragons, leopard geckos, water dragons, leopard tortoises, Honduran tarantulas, flat rock scorpions, chameleons, salamanders and a bunch of different snakes,” he said. Out of all the animals he sells, Glasgow said that one type has outsold all the others during his year in business in town. Glasgow said that the bearded dragon’s draw is they come in various colors and morphs and go from being two-and-a-half inches long at birth to 16 inches to 24 inches long. A bearded dragon ranges from $39 up to $250, depending on the bloodline and the rarity of the breed. The animal eats up to 10 crickets in a day, and Glasgow said feeding them fruit once a week is also recommended. Buying the tank, sand and lighting fixtures need for a bearded dragon will also run a buyer about $200, but once that is purchased the upkeep is pretty inexpensive. Although Night and Day Reptiles’ storefront is only a month old, Glasgow has a few future plans lined up. Night and Day Reptiles is open Monday and Tuesday 9 a.m. to 6 p.m., closed Wednesday and open from 9 a.m. until 6 p.m. Thursday through Sunday. In addition to selling the animals and supplies, Glasgow said he does offer care for exotic animals as well. Give them a call at 775-764-0239 or to see a sample of what the shop carries check out their Facebook page at www.facebook.com/Nightanddayreptiles.